Popular vacation destinations are looking to upgrade their local attractions and your skills are needed to help them with these special projects. Use your building skills to spruce up the local attractions, create 4-star lodging and plan the most exciting get-a-ways to charm tourists and locals alike! Can you get the gondola working at the ski resort? Will the fairgrounds get constructed in time for the hot air balloon festival? Find out as you play through 65 vacation themed levels. 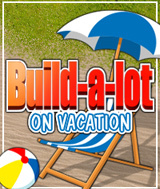 From snowy mountains to sandy coastlines, there’s fun, sun and relaxation ahead in Build-a-lot: On Vacation! Comments: Another great Build-a-lot game. I enjoyed this one just like the others. Comments: lots of fun playing this game. I just love building houses with a time limit.